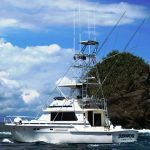 FishCostaRica offers saltwater sportfishing enthusiasts the fabulous opportunity to fish Costa Rica with acclaimed Captain Bobby McGuinness. IGFA award-winning captain Bobby McGuinness is our featured Costa Rica sportfishing captain. We handle his calendar, and coordinate his bookings. The entire sportfishing world knows Costa Rica saltwater charter Captain Bobby McGuinness. Bobby has twice received the International Game Fish Association’s award as the World’s Top Captain. He was given the award in both 2006 and 2010, when he set more IGFA-sanctioned world records than any other captain. At the beginning of January 2019, he registered his 302nd IGFA world record – a Mexican Barracuda. The prestigious Billfish Foundation recognized Bobby McGuinness as the world’s top tagging captain for Pacific Blue Marlin in 2016. Over the course of that year, he tagged more Pacific Blue Marlin than any other captain in the world! In addition, Saltwater Sportfishing magazine named Bobby McGuinness one of the world’s top 50 saltwater sportfishing captains. Bobby has also set more IGFA world records than any other captain fishing in Costa Rica. Over the years he has set close to 300 IGFA saltwater fishing world records. In just two days alone in June 2009, Bobby set an astonishing 16 IGFA saltwater sportfishing world records. Along with winning other IGFA honors, Bobby McGuinness is also one of the few IGFA Ambassador captains. If you want to target Marlin on your Costa Rica fishing adventure, Bobby is the captain for you. On one of his most notable Costa Rica fishing days – September 14, 2010 – Bobby released 28 Blue Marlin, plus three Striped Marlin and four Sailfish. Bobby McGuinness fishes out of Golfito on Costa Rica’s South Pacific coast. 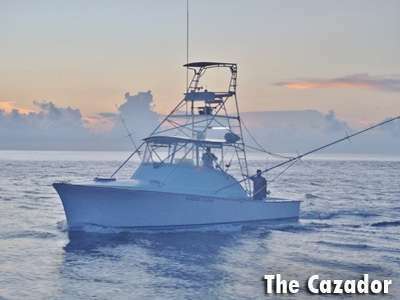 His boat is the Cazador, a 37ft Merritt, specially customized to fish Costa Rica. Golfito has a rich Costa Rica sportfishing history. Bobby’s father Robert McGuinness came to Golfito from the USA in the 1950s to work for the United Fruit Company. An avid saltwater angler, Robert saw the potential of the South Pacific as a world-class sportfishing venue. Robert McGuinness began a small fishing charter operation in Golfito, where he had settled permanently. His teenage sons Bobby and Donald were also among the recruits he conscripted for his nascent endeavor. 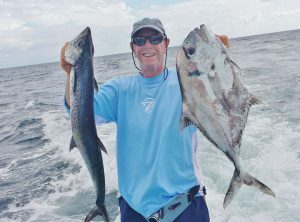 Bobby McGuinness has been a full-fledged, active Costa Rican sport fishing charter captain since the age of 18. He has been fishing out of Golfito for more than 35 years. In addition, Bobby has fished Quepos and Flamingo in Costa Rica. Boat owners have contracted Bobby to captain their boats in Panama, Venezuela, the Dominican Republic and the USA as well. Bobby’s native South Pacific coast offers arguably the best offshore/inshore combination of all the Costa Rica fishing regions. Anglers travel 20 minutes to the mouth of Golfo Dulce, and then 15-20 minutes more to blue water. They can run either south towards Panama, or north toward the Furuno Bank. Once offshore, they can catch Blue, Black and Striped Marlin; Sailfish; Wahoo and Dorado (Mahi-Mahi). 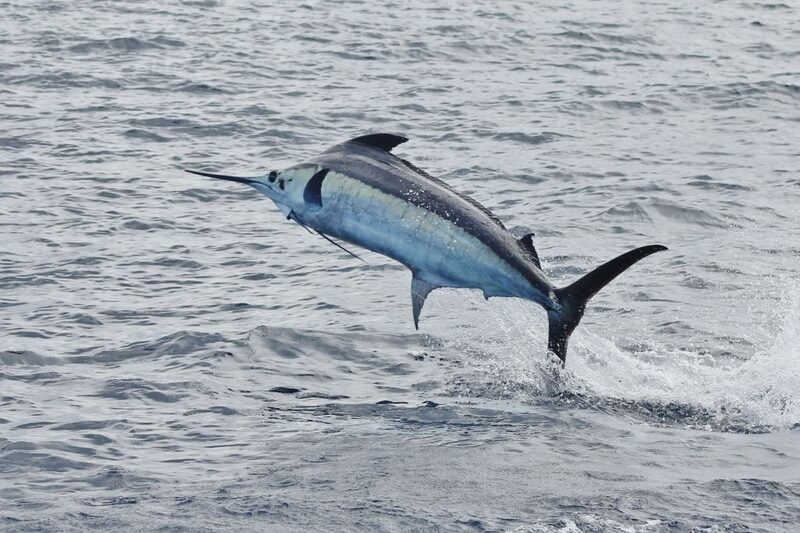 Between May and October, Captain Bobby McGuinness also offers overnight Costa Rica deep sea fishing trips to the FADs for Marlin. FADs are Fish Aggregating Devices, or buoys/sea mounts, that are positioned near natural sea mounts. Bobby has placed buoys on the ocean surface or just underneath, at distances of 20, 40 and 80 miles out. Bobby McGuinness raised and released most of the Marlin that he tagged in 2016 fishing the FADs. Fish, especially Marlin and even Shark, tend to congregate around these FADs. On overnight Costa Rica fishing trips with Bobby, anglers can also jig at night for squid. Spending nights on the water is magical! One to three anglers can fish on the Cazador with Bobby on overnighters for two or three consecutive days. LATEST UPDATE: Bobby now has access to a 54ft Rivieria Yacht for groups of 1-4 anglers, five at a pinch, for three-night, two-day overnighters, and four-day, three-night trips. Furthermore, the South Pacific coast has an incredible array of Costa Rica nearshore fishing species. Feisty Roosterfish are a huge attraction. 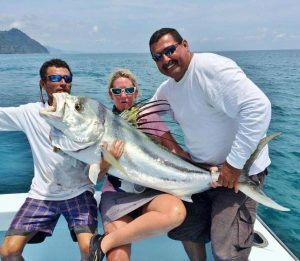 In addition to anglers from the USA and Canada, FishCostaRica has booked anglers from Australia, Latvia, the Ukraine, Russia, Nicaragua, Uruguay, France and Sweden, to name a few, to fish for Roosterfish with Captain Bobby McGuinness. Inshore, there are also a dozen members of the Snapper family: Red. Cubera, Mullet, Yellow, Rock, Gray, Spotted Rosy… Furthermore, anglers can also catch delicious Common, Broomtail, and huge Goliath Grouper. Jack and Amberjack abound, as do Pompano, Parrot Fish, Mackerel, Shark and Barracuda. 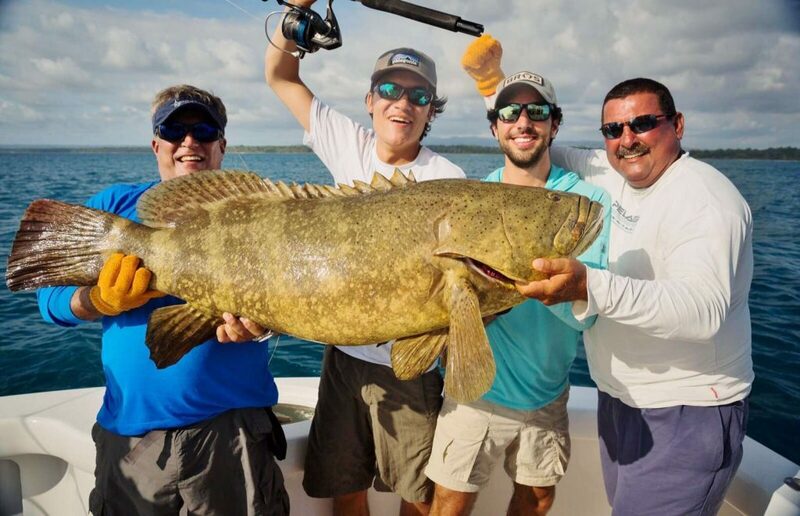 Don’t miss the opportunity to fish with IGFA award-winning captain Bobby McGuinness. Contact FishCostaRica today. Offshore or nearshore, a Costa Rica fishing adventure with Bobby McGuinness will be unforgettable. 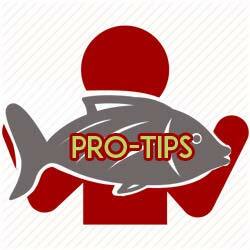 Not only is Bobby one of the world’s top saltwater sportfishing captains. He is also one of the nicest guys in the Costa Rican sportfishing business. An incomparable raconteur, Bobby with keep you entertained during and after your charter on the Cazador. Contact us for more information about how you can fish Costa Rica with Captain Bobby McGuinness. If you are already staying in the Golfito or Puerto Jiménez areas, we can book one or several-day charters. Day 1: Arrive San José international airport. Get here as early as possible! Enjoy a comfortable a/c minivan transfer from the San José airport to Golfito, or a 55-minute commuter flight. Overnight at a Golfito hotel, Single or Double accommodation. Day 2: Full day fishing with Captain Bobby McGuinness, offshore or inshore. Overnight at a Golfito hotel. Day 3: Full day fishing with Captain Bobby McGuinness, offshore or inshore. Overnight at a Golfito hotel. Day 4: Full day fishing with Captain Bobby McGuinness, offshore or inshore. Overnight at a Golfito hotel. Day 5: Take a cab to the Golfito airport for the 6:40 AM commuter flight to San José. Walk to the international terminal to connect with any flight departing after 10:30 AM. This is the very basic Costa Rica fishing trip with Bobby McGuinness. Like every one of our complete Costa Rica sportfishing packages, FishCostaRica can tailor your trip to your exact preferences. Fish one or two additional days, or even one day less. You can also add a relax day between Cazador charters. You can also arrive in San José, and instead of immediately leaving for Golfito, overnight in San José. Then travel to Golfito the next day, and fish with Bobby on Day 3. Or, instead of leaving Costa Rica immediately you fly back to San José, spend one or more days here. Stay in San José or anywhere else. FishCostaRica can arrange your entire vacation. Please note. We can also book fishing charters and complete sportfishing fishing vacations with Bobby McGuinness out of Puerto Jiménez. 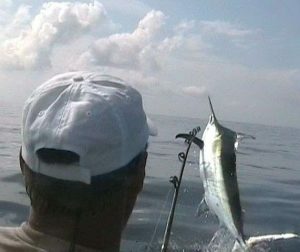 So contact us now to fish Costa Rica with one of the world’s acclaimed saltwater sportfishing captains. Fish with Captain Bobby McGuinness. and enjoy the Costa Rican sport fishing adventure of a lifetime.